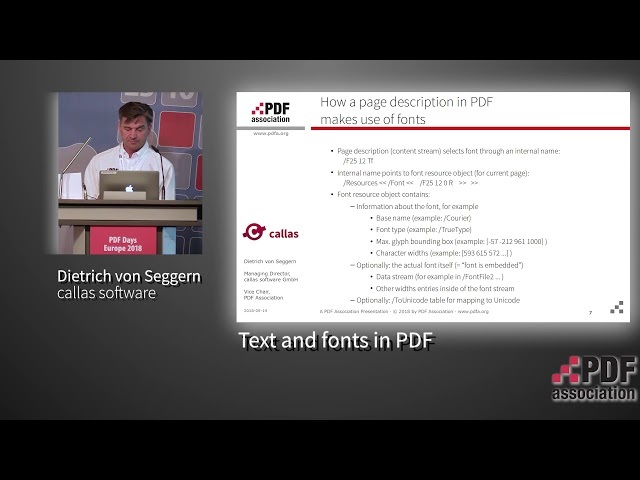 Dietrich von Seggern, Managing Director of callas software, hosted this presentation at PDF Days Europe 2018. While font formats have become more modern and overal fonts have become higher quality, problems with fonts and text are still a sizeable chunk of what goes wrong with PDF documents. When looking at PDF 2.0 not much has changed in this area. This session gives an overview about how fonts are used in PDF and in which way this relates to frequent font problems in PDF or PDF/A. As a tool Acrobat Preflight’s PDF Browser will be explained and in which way it can be used to track down text and font issues.